No matter how Nolier-than-thou your friend may be, no matter how long that salty local at the bar says he has been here – the Fair Grounds has been here longer. According to its website racing has taken place on that piece of land off of Gentilly Boulevard since 1842. That’s 19 years before the War – the Civil War. That’s old-timey. That’s “General Custer used to bet here, and then went and had his last stand” old-timey. Okay, enough with the italics. The place is an institution, and institutions have heroes – Risen Star, Grindstone, and Black Gold all ran at the Fair Grounds and into the history books. The Fair Grounds is steeped in legend. Yet, it is also eternally young, and inherently pointed to the future. The horse industry exists as a veritable fountain of youth. Pumping new blood into the sport, as each year a new crop of colts and fillies burst forth and take to the dirt and grass to show their unmatched athleticism at the races. According to the Hennegan Brothers lovingly-crafted documentary, “The First Saturday in May” (hanky alert: it’s the Barbaro story) – there are 40,000 thoroughbreds born a year, and 23,000 will make it to the track, but only 20 will make it to the Kentucky Derby, and only one will be crowned with the garland of roses and have a shot at the Triple Crown – last year, American Pharoah was that horse. I hope you took the time to catch the phenomenon from Zayat stables. The owner, Ahmed Zayat, committed to the fans and showed his love for the sport by continuing to race the first Triple Crown winner in 37 years – literally risking over 100 million dollars in stud fees for the love of the game alone. Even though American Pharoah placed second to Keen Ice in the “graveyard of champions” at Saratoga, he went out in style – beating the best from around the world at Keeneland in the Breeders’ Cup Classic. American Pharoah went out a champion, and retired to Ashford Stud in Versailles, Kentucky. The Breeders’ Cup ran on Oct. 31 – which actually could be considered “last year.” For, about an hour before the Classic ran, it was the Breeders’ Cup Juvenile that was center stage – a new crop of 2-year-olds starting their journey toward superstardom. Exaggerator, a son of Curlin, finished fourth that day in the Breeders’ Cup Juvenile. The colt shipped into Louisiana soon after, and this past weekend had his heels to the field, winning the $1 million dollar Delta Down Jackpot, in Vinton, Louisiana. Another 2-year old, Dolphus, made his debut this weekend at the Fair Grounds in a $40,000 maiden (horses that haven’t won) race. His victory, while not the quickest time or for a huge prize, caught the interest of the national horse press as well. Why would a young 2-year-old, running his first race on a cold Sunday afternoon in New Orleans, warrant such attention? This is horse racing, folks – so it’s all about the connections. Dolphus’ father is 2010 Preakness Stakes and Haskell Invitational winner Lookin At Lucky. A horse that ran against the best, and usually always hit the board. Pretty good, but he’s not why the industry was checking out the results from the Fair Grounds this past weekend. Dolphus’s mother is a filly named Lotta Kim, and that filly’s father was Roar. And – oh my god Mark, just get to the point. Dolphus is the half-brother of Rachel Alexandra. You’ve probably heard of Rachel Alexandra. Her girls versus the boys storyline transcended the somewhat reclusive boundaries of the sport. 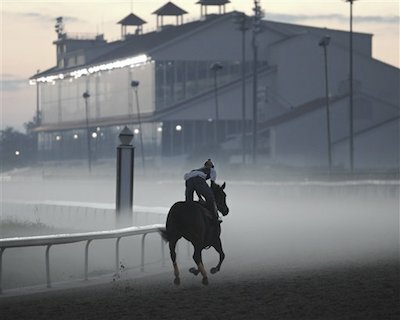 Over a span of 14 days, Rachel Alexandra, ridden by Lafayette’s Calvin Borel, set the horse racing world abuzz in 2009. Riding into Derby weekend (Rachel would run in the Oaks), there was much debate about if Rachel could beat the “boys.”As the Kentucky Oaks ended, there was little doubt. Rachel Alexandra demolished the field of fillies by 20 ¼ lengths, setting a Kentucky Oaks record. Then, just two weeks later, she got her chance against male competition, and did not disappoint – besting the field, and Kentucky Derby champion, Mine That Bird, in the Preakness to become the first filly to win that classic in 85 years. She would enjoy a nine-race win streak, defeating the boys again in the Haskell and Woodward Stakes. Watch her victory in the Woodward, and try not to get goose bumps listening to Tom Durkin’s call. Her win streak would end, oddly enough, when she placed second to Zardana in the New Orleans Ladies Classic at the venerable Fair Grounds. She would be voted Horse of the Year in 2009, and the Fair Grounds would name a stakes race in her honor. And now her half-brother, Dolphus, has stomped over the same dirt and taken victory on the same track. Her career is in the history books, but his is only beginning. Next spring, as a 3-year-old, he could turn into the “next big thing” and New Orleans race fans can play “remember when.” Or, just as likely, Dolphus will be just another racehorse (remember there are 23,000 gunning for the same prize). He might pick up a few victories and take some losses, and the crowd’s fascination will turn to another racing blueblood or hot prospect. That’s just the way horse racing is – you never can tell. I’ll see you on the rail. And like a fine wine with a steak dinner, every race should be accompanied by a beverage and song. Turmoil descends upon the LSU Tigers football program – as the Tigers follow the crushing defeat to Alabama, with losses against Arkansas and Ole Miss for their first three-game losing streak since 1999. The Tigers have been outscored 99-47 over that stretch. Rumors are flying in Baton Rouge about Les Miles’ coaching career coming to an end. Weird how just over two weeks ago, fans were dreaming of national titles. Football is crazy, man.